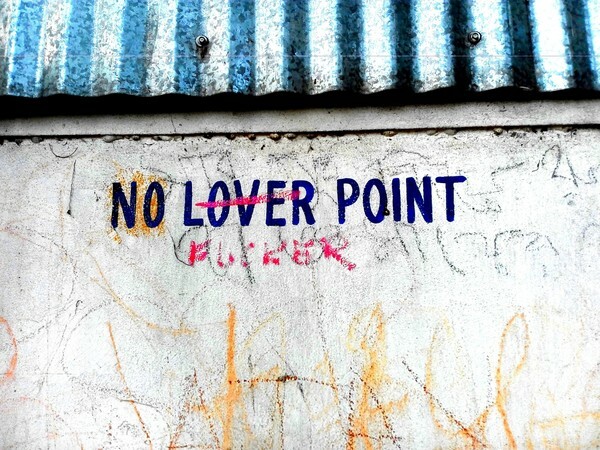 “NO LOVER POINT” is stamped at many points on the long wall along the path to the masjid. The blue-and-white of the awning is a signature that the Trinamool Congress government leaves everywhere possible in the city. All images by Brinda Bose. Growing up in Calcutta, walking through neighbourhood streets, one sometimes overheard a belligerent threat spilling out of a street-fight: “Beshi kawtha bolle mukher geography paalte debo!” – “if you talk too much I will change the geography of your face!” Pursued or not, the implication of the threat was that it would be a change for the worse. 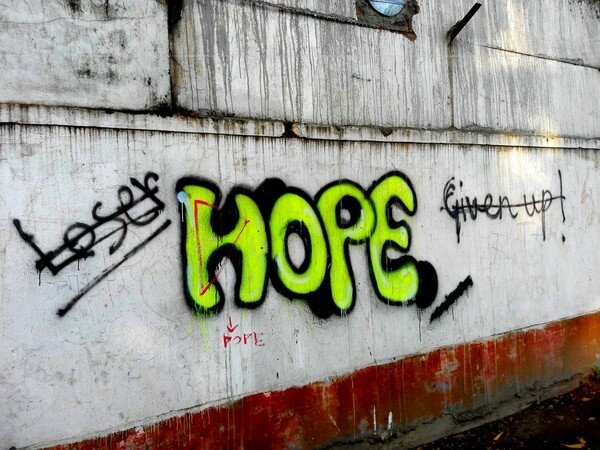 Over the last decade or so, the ‘geography’ of Calcutta’s face has been changed considerably, and proactively, by the present regime – for the better, one would say. And among many changes, a visible one has been wrought on the Rabindra Sarobar lakes (formerly known as the Dhakuria lakes) in the south of the city, now prettified beyond recognition from a few years ago. An artificial waterbody dredged out of marshy lands around 1920, the area of the ‘lakes’ stretches over 192 acres. 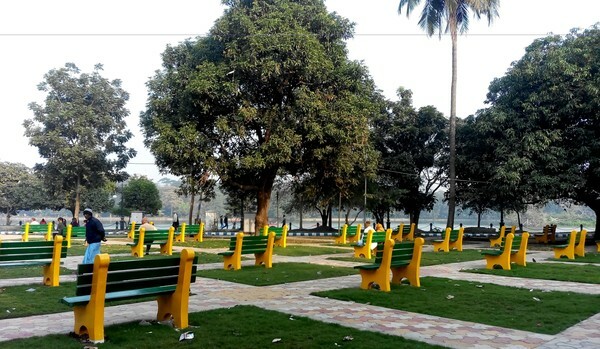 The Kolkata Improvement Trust, a century-old statutory body under the West Bengal government, was entrusted with its improvement and beautification plan worth INR 200 million (USD 3 million), on which work began in early 2014. Perceived as West Bengal Chief Minister Mamata Banerjee’s biggest gift to southern Calcutta, it is one among many that ‘Didi’ has presented the city with, to make it look and feel lighter, brighter, better. Prized found object: a broken-toed metallic sculpture of a foot lying within view of the lakes. These are likely to be remnants of idols discarded by a ‘museum’ of Durga idols set up in the vicinity. One would have to be churlish to think that, amid choking urban cement sprawl and automobile fumes, a clean space to soak up the sight of placid grey-green waters, and walk, rest, nap, exercise, gossip or read is unwelcome. In fact, hundreds of old and young people swarming to the lakes from dawn till night is proof of how precious this space has become for people, this freshly-revived ‘lung’ on the southern side of a gasping metropolis. And yet, cities and their public spaces are palimpsests, developing, growing, changing – layer by layer – acquiring new faces, perhaps even new dreams, but never quite losing what has gone before. Around these jewel-like lakes of Calcutta, other lives – secret, illegitimate lives – continue to lurk and peep from the most unexpected corners, as one rounds a bend or takes a few steps clear of the perfectly laid-out walkways. For some, those glimpses – broken bits of religion and stolen kisses which have provoked stern police warnings – are what make the lakes a real, breathing, colourful, rotten place still. Those outliers to the anodyne jogging paths are what draw some back to the lakes when pleasure in the stiflingly pleasant begins to wane. The very idea of protesting the beautification of spaces in cities, whose filth and squalor we have endlessly bemoaned, might seem out of place. 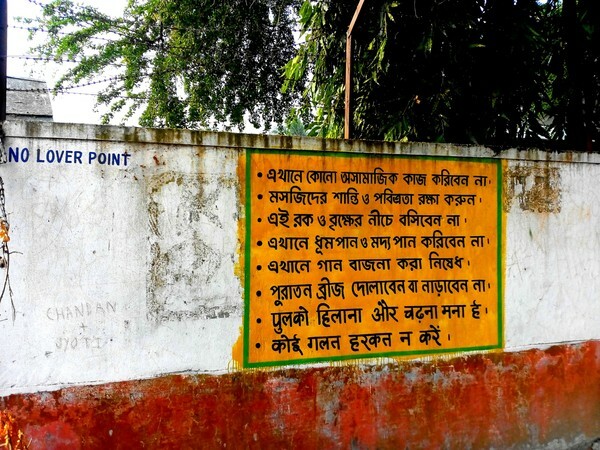 And yet, there seems something so synthetically sanitised about the Sarobar lakes now – earlier notorious for its messy jhalmuri-phuchka hawkers, its ganja-wafted air, its snuggling lovers in dark corners, its many chyangra chheler dol (gangs of layabout male youth) – that something remains persistently irksome about the artificial allure of these artificial lakes, even though it would be foolish to romanticise the effects and affects of the past, too. An arrangement of fixed benches covering a large area outside the walking and jogging paths; they face the lakes but look awkward, like a viewing gallery gone wrong. 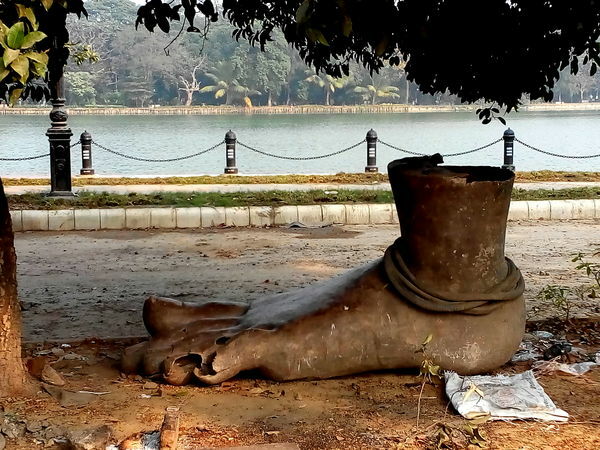 One of the many bizarre half-broken, sun-and-rain-drenched abandoned idols found strewn outside the ‘beautified’ area of Rabindra Sarobar lake, around an overgrown path that leads to the railway tracks. 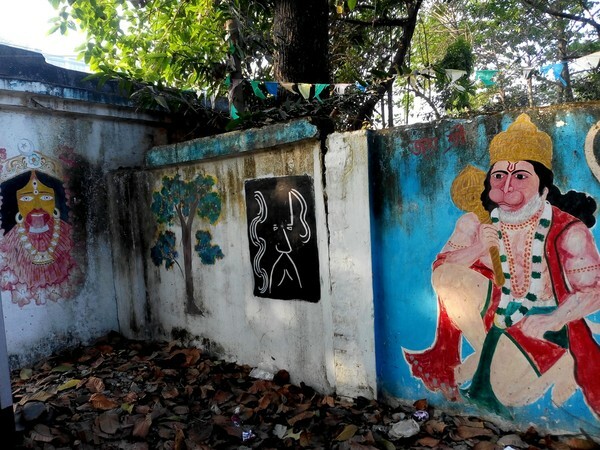 The figure is rumoured to be an erstwhile occupant of the gallery of Durga idols set up near the lakes. The lakes area is crowded with trees, birds and unusual spots of interest. In a partial census of trees covering an area of about 45 acres in 2012, around 50 species were identified. 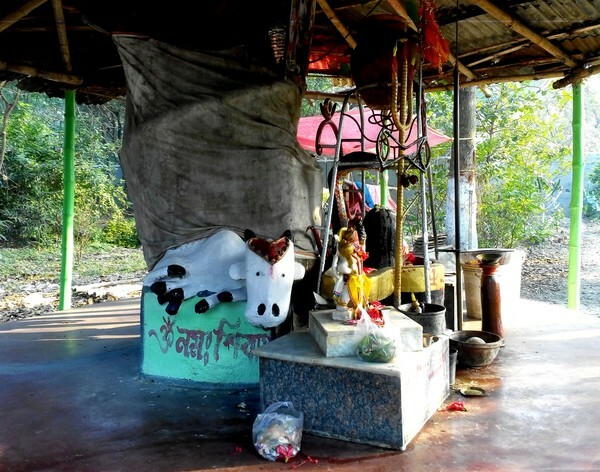 There are Hindu, Buddhist and Muslim places of worship around the lakes. A hanging bridge connects to a mosque on an island in the lake. 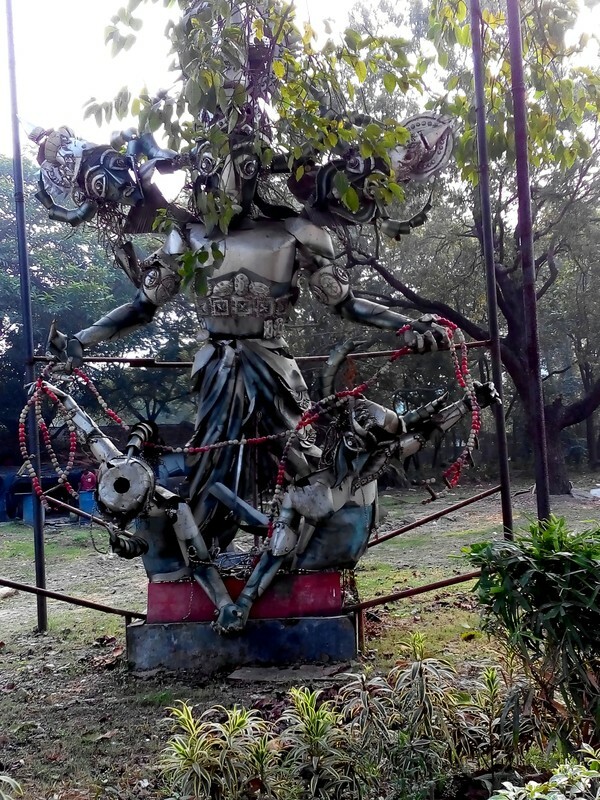 In a quaint, promising venture, a warehouse in the area was converted in 2012 into a museum of public installation art, comprising of award-winning Durga idols of the city, and became locally known as thakur-der gallery. However, negligence appears to have rendered it practically obsolete. But what remains most intriguing in crannies around the spruced-up surroundings of the lakes are unruly remnants of art and religion that somehow survive the rain, sun and gruesome humidity of the city as well as the zealous cleaning crew’s hawk perusals. And most sinister of all is the stomping of the moral police in the name of no law, arbitrarily stamping some sheltered nooks along the less-trodden walking routes with zombie-like insistence, ‘No Lover Point’. 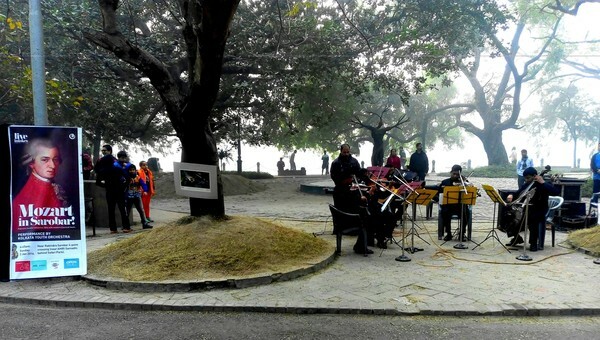 A spot designated for free musical entertainment on occasional Sundays, titled ‘LiveInLakes’. A Mozart concert amid the winter haze is quite in contrast to the audacious graffiti and abandoned idols in glorious technicolor. I sense a connection between the ‘beautification’ of the lakes and moral policing around them, and the slow painful choking of such working-class precincts into invisibilisation. This is another feather in the cap of the ‘Bangla’ Chief Minister Banerjee, in tune with her dream ‘Biswa Bangla’ (literally, World Bengal) project, which, in developing the ‘dying arts and crafts’ of Bengal, aspires to give the state a ‘global’ profile. To the government, the goal is to push anything visually unsavoury into oblivion in a state that had apparently lost all lustre under what is now popularly considered a 34-year ‘onslaught’ of Left rule. The point is to then garner votes with unreal visions of gentrified happiness in an aseptic glitziness of surfaces – horizontal and vertical – all over the city. Everywhere, there is a pitch for a surfeit of light, lightness, blitheness, signified best by Rabindrasangeet playing over loudspeakers at traffic signals. A profile of Rabindranath Tagore flanked by the popular Hindu figures of Kali (left) and Hanuman, the latter perhaps a portent of worship and power slowly changing hands. Like its ‘lover points’, there are numerous sites of worship lurking just outside the precincts of the lakes. Sometimes they just consist of small bright idols perched at the foot of tree trunks or half-hidden under makeshift shrines. Sometimes, like here, they are more ambitious, though still under impermanent shelters. All bear signs of lively, rigorous, daily worship and care. What is the power, and nature, of gilt, then – and what power lurks still in the dust? Graffiti that is bent on disturbing the neatness of neighbourhood hangouts and their white walls. ~ Brinda Bose teaches English Literature at Jawaharlal Nehru University, New Delhi. Really well articulated, brings to life the complexities that make up a progressive ‘bangali kaltar’.